Welcome back to Craving Ellie in My Belly! It's been a few weeks, but Ellie Krieger and I are back in action. 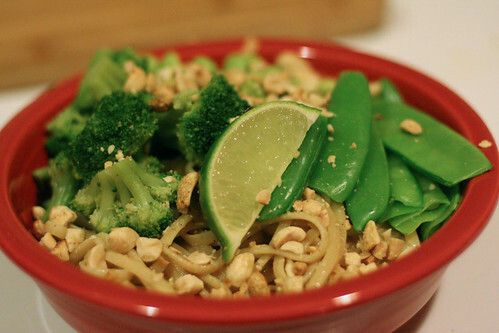 I think I may have jumped and/or squealed with delight when I saw this week's pick, Aromatic Noodles with Lime-Peanut Sauce, hosted by Supplicious. I pretty much love everything about this dish: each individual element and the way they come together as a whole. The green veggies are so pretty! I've been finding that Ellie's recipes aren't the quickest, weeknight-friendly dishes (maybe that's why she's coming out with a new book with that in mind...hmm...). If you do have a little time to spare for prep, these noodles are worth it. I made lots of changes to the order of the steps and the little details in this recipe. I definitely preserved the integrity of the original while putting my own spin on it (i.e. adding edamame for a bit of protein). I also steamed all the veggies in the microwave, it was just easier that way. My changes are reflected below. For the original, click here. 1. Toast the peanuts in a small dry skillet over medium-high heat until fragrant, 3-5 minutes, stirring frequently. Set aside to cool. 2. Cook pasta according to package directions. Drain and rinse under cold running water, set aside. 3. Steam peas and broccoli either using a steamer basket on the stove or in the microwave until they are bright green and crisp-tender. 4. Make the sauce by pureeing the peanut butter, soy sauce, water, vinegar, lime juice, scallion, ginger, brown sugar, red pepper, and garlic salt (if using) in a food processor or blender until smooth. Coarsely chop the cooled peanuts. 5. Right before serving, toss the pasta with 3/4 cup of the peanut sauce. Divide into bowls and top each serving with veggies. Drizzle remaining sauce over vegetables. Sprinkle with peanuts and serve. Love the edamame idea.......great job! Lime? Peanuts?! Noodles?!?! Does it get any better than this?! Cannot wait to make it! Next time my husband comes to visit and takes me to the grocery store, I know what I'm making! edamame was a great idea! I will add those next time I make this, it was so delicious. 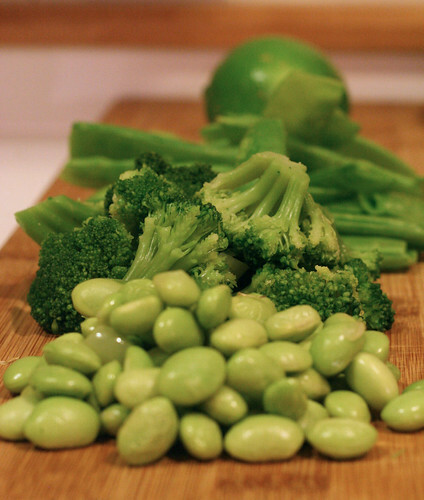 The edamame idea is terrific. This was a super dish and it will hit my table again, for sure. Your pics. make it look even better. I steamed in the microwave, too. So much easier. The edamame was a wonderful addition. It was a delicious meal! Beautiful photo, too! I love the pic! Is that a fiesta red bowl?! Also like the idea of using edamame.. will definitely do that next time. mmm, I love edamame!! Unfortunately I hate peanuts and peanut butter more than anything so I had to sit this one out. Your pics look amazing and this looks like it could be served in a restaurant!!! Thanks so much for the kind words, everyone! I adored this dish, and the edamame really took it to another level. Great picture! I love the way the red bowl really makes the green of the veggies pop. Well done.